I had been cooped up for several weeks with my new honey-bunch of a baby number two, who, to put it lightly, was truly pushing my limits as a mother. And as a person. I often questioned my sanity at times. As much as I adored her& marvelled at the gift that God blessed us with, her need to remain at my bosom, or at the very least, live in MY arms 24/7. (and ONLY my arms)…everyday….all day, was wearing on me. Physically and psychologically. I could go no where, not even the loo, without blue murder being screamed – seriously, purple in the face type screaming. And my neck and shoulders were in spasm from the round-the-clock cradling of her. She was also the worst sleeper to boot, leading to crazy sleep deprivation.Like proper sleep deprivation – not the “I got 2 hrs here and 4 hrs there” type of sleep deprivation I often hear some parents complain about. Im talking NO sleep here, people. All of which amounted to me getting a serious case of cabin fever. I needed to get out of the house. Without her. And whilst this may seem like a no brainer to some – like, just get out and go,already- the ironic twist in my conscious need to have a break from her – before insanity truly reigned in my being – was that I too felt like I couldn’t leave her. I had, like most mothers, a demented sense of responsibilty to be with her all the time and see to her needs, at all costs. I am her mother,after all.God had entrusted me (us) with this child of His. Otherwise what kind of a mother would I be? Right? Every bit of my being wanted to be with her – except that bit that was sleep deprived and going nuts. So with a little bit of coaxing from hubby, and then a whole lot more from him AND my mom, I was convinced enough to make a quick dash out in the neighbourhood. Hopefully discover something new. And as it turned out, I was not disappointed!Enter The Painted Cottage! 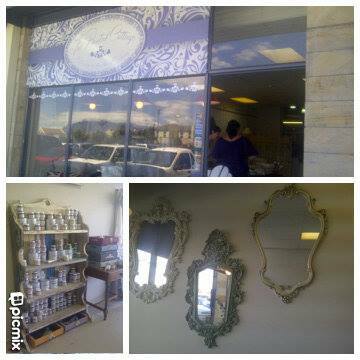 The Painted Cottage is a new store out in Parklands, West Coast that I’m absolutely boinkers about! Mirrors with drama, up-cycled wooden pieces of beauty, locally crafted pottery and the amazingly easy to use Chalk paint. (Not just limited to blackboard folks! This versatile substance can be used on just about any surface-without any prepping or priming! And it comes in an array of colors to give all you crafty creatives the proverbial woody!). What’s more, is that they run how-to workshops as well! Their first installations started up now in Feb 2014. So, if you’re in the West Coast area, you’ll really want to come pop in at this charming little store. And if you’re not in the area, trust me, you’ll want to make the trek- it’ll be worth the drive. Whilst I know and willingly accept that leaky breasts, nappies, colic, and poop up to your elbows and all over your shirt are all part of parenthood, I was in another devastating state of motherhood. I was like in the super sayan level of colic and sleep deprivation. And I was clearly way off the mark with that much talked about “balance” that one is supposed to strike as a parent. But there, in 20 min at a local store, I found some of it. I had found a creative outlet. So oddly enough, discovering this little gem of a store lengthened my tether that I thought I was at the end of. No matter how intense the situation, or how rough its going in the trenches of motherhood, and you still feel the need to push ahead because you’re a mother: Good for you. Well done! Keep pushing as far as you can. BUT, when you can’t anymore, don’t beat yourself up. You’re doing your level best and you’re doing a great job at that. Recognize that and OWN it! But perhaps you need a bit of a break? Take it. Forget the mommy guilt- yes, its natural, but it doesn’t help you any, nor your baby. What WILL help mommy,however, is that break – no matter how small it may be. And what will help baby is a happy balanced mommy. Find whatever it is that shall provide respite and energy renewal for you. Walking, cycling, kickboxing, fabric painting, pottery, reading, writing…blogging! Whatever floats your mommy-boat-do it. And if you’re lucky, get a good solid nap in there…like I said, if you’re lucky! Also for the new moms out there, take heart, often these mothering lows whilst seemingly very intense and never-ending, are far(,far,far) fewer than the inexplicable mothering highs. I promise! Have you also been there? You know, where you felt more like prisoner of war, than a mom? What helped you get through those times? What do you do to help restore your balance? Go wild in the comments section below 🙂 Im keen to know how other moms do it out there. So true friend! Love the article! your honesty is refreshing! I struggled with the prisoner of war feeling (and guilt and anger!) many nights trying to get my DD to bed, or naps…rocking, pacing, singing, patting, bouncing… Crying! Me not the baby! sometimes an hour later she would still be awake but overtired! it was exhausting!!! Especially when she still took 2 naps a day plus bedtime!wondered how I was gonna do this without losing my marbles! things have definitely improved with her now, she falls asleep lying next to me, but some nights i feel like I’m back in that prison.. When she fights the sleep and all I wanna do is go watch survivor or masterchef!At least once she’s asleep, she sleeps!… Mostly haha!